More than a decade ago, I attended evening tours of the Metropolitan Museum of Art guided by the ultra-enthusiastic art historian Lee Sandstead, who later hosted the Art Attack program on the Travel Channel. Of course, I’ve visited the museum many times since then, but rarely if ever after dark. That streak ended this past summer when I was in Manhattan one night and had time to kill. So I stopped at the Met and roamed through some of my favorite rooms, the American Wing and the ancient Greek and Roman galleries, carrying only my iPhone camera. What a difference a time of day makes. Memory (foreground and bottom left) and Mourning Victory (background and bottom right) by Daniel Chester French. Second Row: Fragilina by Piccirilli (left) and Leda and the Swan by Sarrazin (right). Instead of the midday sun splashing through glass ceilings to reflect harshly off the sculptures, the evening’s dark and the museum’s dimmed lights wrapped the cold marble figures in warm shadows. 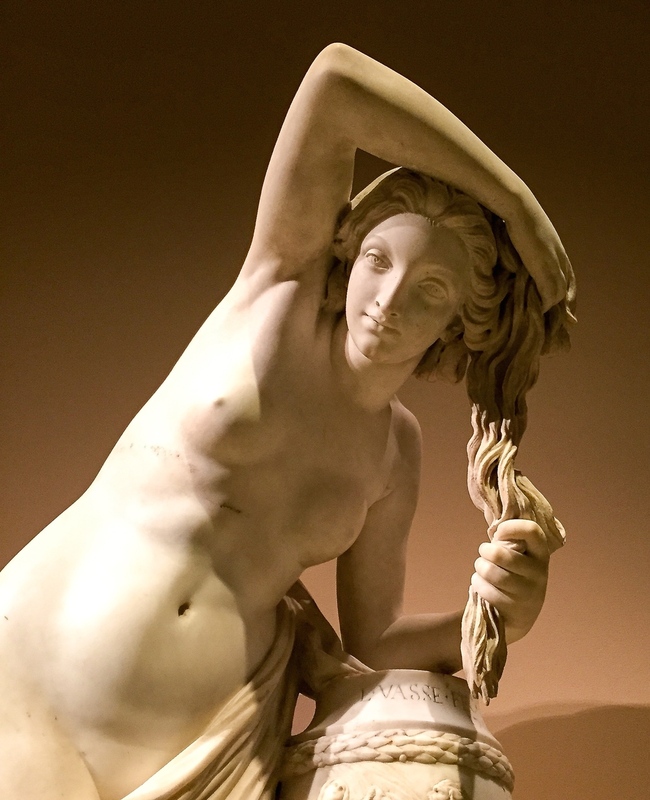 This intimate mood led me to focus on the subjects of this blog, female nudes, from the aptly named Evening by Frederick Wellington Ruckstull to the Nymph of Dampierre by Louis Claude Vasse. After all, I visit art museums in part to cross paths with such beautiful woman, whether of stone, paint or the flesh. Three Graces relief (above). Bather by Houdon (bottom left) and Evening by Ruckstull?